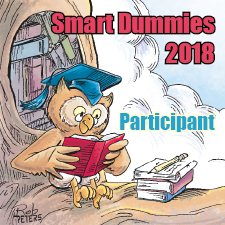 Smart Dummies registration is now Closed. Sorry you missed us this year. Please sign up for emails for next year's event. Be sure to check out Spring into Writing -- event starts May 1st! Be sure to follow this blog by email to get reminders and read other great posts. Smart Dummies is a whole month dedicated to helping Illustrators to create their picture book dummies! This is a FREE EVENT! When is it? Smart Dummies starts September 1st. There will be a pre-event in August to help you get a head start. How do I sign up? Sign up runs late July-September 7th. The extended time is for people starting in August for Pre-Smart Dummies. Be sure to follow my blog by email so you can keep up to date with any announcements. Registration is absolutely free for this event! What's the goal? The goal is to complete the basic images for your picture book dummy in one month. We work on the honor system, so you don't need to post any images to win. Are there prizes? Absolutely! Below is the list of last year's prizes. What do I need to bring? A polished manuscript, a story/song/rhyme in the public domain (think Grimm's Fairy Tales). It's strongly recommended that you have a story to work on. If your story is all in pictures bring art notes, strong art ideas or thumbnails to draw from. You do not have to be a Writer to join. If you want your story to be wordless, that's okay! How can I help? If you are a published Illustrator and would like to do a guest post, please email me at smartdummies@hotmail.com or using my contact form. For this event I'll be mostly approaching people who have published work, have worked in Illustration for years or those who have special insight into creating picture books. You are also welcomed to contact me if you have a prize to donate! Who are the guests? A list of guests will be posted in August! See the list of guest from last year below. Aijung Kim was so happy with her prize last year that she's donating some of her lovely art cards! Traci Van Wagoner A poster of her art through Traci's Redbubble store. Marla Lesage: A Portfolio Critique OR Dummy Critique! Sarah LuAnn Perkins 8x10" print from her print shop!